University of California President Janet Napolitano, right, listens to students voice their disapproval to tuition increases during a meeting of the University of California Board of Regents Thursday, Nov. 20, 2014, in San Francisco. SAN FRANCISCO (AP) — University of California President Janet Napolitano prevailed Thursday in persuading the university's governing board to authorize five years' of tuition increases, a deliberate but politically risky move likely to ignite months of debate to determine if the costs ultimately fall on students or taxpayers. Over the shouts of demonstrators and the opposition of Gov. Jerry Brown, the UC Board of Regents voted 14-7 to approve tuition increases of as much as 5 percent in each of the next five years unless the state devotes more money to the 10-campus system. Napolitano says the tuition hikes, which would increase the cost of a UC education by 28 percent by fall 2019, are needed to maintain the quality of the nation's largest public university system, promote stability and accommodate more students in the face of inadequate funding from Sacramento. "I understand that the state operates on a year-to-year cycle. But we owe it to the university not to be prisoners of that cycle," she told regents before the first of two votes on her five-year framework. Approval of her proposal shifts the question of whether the increases will be enacted or averted to Sacramento, where the governor and legislative leaders will start negotiating in January over the university system's budget for next year. Lt. Gov. 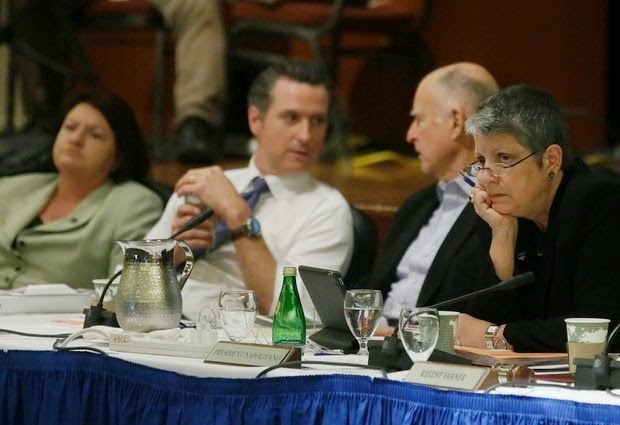 Gavin Newsom, who joined Brown in voting against the pending hikes on Thursday, predicted after the vote that the talks would include trying to boost that funding beyond the additional $119 million now budgeted so a tuition increase in fall 2015 could be averted or reduced. But Newsom said the gamble Napolitano took in trying to force the governor's hand without allowing time to consider alternatives could backfire. "They have completely divided themselves and created a rift that I have not seen in four years between themselves and the governor and the Legislature, at a time when the governor was more amenable to more funding," Newson said. "This whole process was, I don't want to use the word despicable, but I will." Former California Assembly Speaker John Perez, whom Brown appointed as a regent this week, told reporters after the meeting that he thinks the proposal was a politically unsavvy and "cynical" move by Napolitano that was more likely to alienate elected officials than pressure them into boosting the system's budget. "It's starting off with an overly contentious posture when there doesn't need to be one, contentious toward the governor and contentious toward the Legislature," he said. Tuition rates have been frozen at the University of California for the past three years following a series of increases that have nearly doubled UC tuition since 2006. Under the new plan, the average annual cost of a UC education for a California resident would increase by $612 to $12,804 next fall and to $15,564 by fall 2019. Other public universities have raised their tuition amid state funding cuts during the recession. But the rapid rate of the increases at UC, where higher education was once free and fees have historically been below the national average, has made the issue particularly contentious in California. Brown, who earned his undergraduate degree from UC Berkeley and has made fiscal restraint a hallmark of his second stint as governor, is insisting that the university find a more frugal way of doing business. He has suggested reducing costs by offering more online classes, requiring faculty members to devote more time to teaching instead of research, and curbing salaries for administrators and professors. Napolitano and other UC leaders are resisting his suggestions, saying the ideas would destroy the university's standing as the nation's premiere public university. They say the money they seek either through higher tuition or a bigger state allocation would go toward rising employee retirement and health care costs, hiring more faculty members to lower class sizes and improve course availability, admitting more students, and increasing financial aid. "It's really about the competing visions," UC Chief Financial Officer Nathan Brostrom said about the clash over tuition. "We really want to increase access, we want to increase financial aid and we want to improve our quality." Brostrom, who oversees the system's budget, said only students with annual family incomes above $175,000 would pay the entire increase, and more than half of all UC students would continue paying no tuition thanks to financial aid. Students have called for the ouster of Napolitano and said they were angry about the tuition hikes and because the outcome seemed certain even before the proposal could be debated. "Seeing you all come in laughing and smiling and talking about stuff made me sick to my stomach," tearful UC Davis student Amelia Itnyre, 23, told the board. "You should be crying, you should be praying, you should be figuring out what you are going to do to fix this."